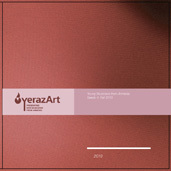 YerazArt 2011. All Rights Reserved. 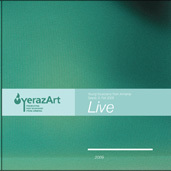 YerazArt 2010. All Rights Reserved. YerazArt 2008. All Rights Reserved. 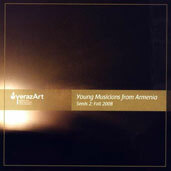 To listen and purchase the YerazArt Young Musicians from Armenia, Spring 2007 CD recording entitled "Seeds: Armenian Classical and Folk Music Miniatures", please click here. YerazArt 2007. All Rights Reserved. Demand for an album of this nature grew out of three years of presenting young musical talent from Armenia through the YerazArt concert tour program across the United States. The question that kept popping up after shows, and in anticipation of others, was consistently, "where can I get a recording of these musicians?" Given the relatively young age of the program participants, a recording was never seriously considered until recently. 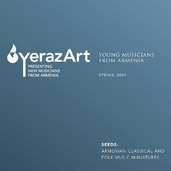 In response to audience demands for a tangible product from the YerazArt Young Musicians from Armenia, comes "Seeds: Armenian Classical and Folk Miniatures". This album is designed to convey two main ideas. First, it is a snapshot in time of eight young musicians who were selected to participate in a tour of the United States in the spring of 2007. Each of the musicians was chosen based on recommendations from a 17-person YerazArt advisory board panel in Armenia. The spring 2007 tour was secured for the United States, and the musicians went hard at work creating a program of music that would showcase their talents and versatility. The recording sessions were quick, live in feel, and deliberately raw in order to capture the authentic and spontaneous nature of their strengths and limitations. The second main idea this project attempts to convey is the depth and richness of Armenian music. For many performers on this album, the selections chosen are considered encore pieces that conclude a more balanced Western/Russian/Armenian concert program. Aram Khachaturian's "Toccata" is a good example of a classic encore pieces. Yet, there are other selections that are considered less superfluous and rarely recorded such as Edward Baghdasaryan's "Nocturne" and Arno Babajanian's wildly nervous "6 Pictures for Piano". Selections from Armenian icons such as Ashugh Jivani, Komitas, and Vagarshak Kotoyan are included. Indigenous folk music performed on the duduk and vocals set to an ethnographic style are also on display. These are essentially the "chestnuts" of Armenian encore music. All of them full of color, flair, and a distinctly unique identity. In many ways, "Seeds" is a curio of sorts. If, at this tender age young Armenian musicians are able to perform at this high caliber, what will they be like in 5 years, or maybe even 10 with the right direction, educational access, master classes, and seasoned concert experience? Journey into the hearts of three prodigious musicians from Armenia who dare to dream of big stages, while having to overcome economic hardship in their native land. Filmed on-location in Armenia, Anush A. Hovsepyan's short film is a glimpse into the lives of ordinary teenagers such as Meri, Harutyun, and Iren, who struggle to find instruments to practice on, cannot pay for master classes, or don't have the access to international competitions in order to display their musical talents. In an effort to stem the tide of lost opportunity in Armenia, the YerazArt Foundation is committed to showcasing young local Armenian musicians on global stages, while creating opportunities for potential supporters and concert presenters to have a direct impact on the future of Armenia's cherished musical tradition. This DVD features interviews with dudukist Gevorg Dabaghyan (Yo-Yo Ma's Silk Road Project, Shoghaken Folk Ensemble), Ara Gevorgyan (Armenian world music artist), and Aram Gharabekian (Artistic Director of the National Chamber Orchestra of Armenia).